I’m a sucker for brands who interact well with their customers (and especially potential customers) on social media. Last month I tweeted that I was super excited for dinner at Cucina Enoteca with my high school best friend while down in San Diego for Mother’s Day weekend, and within two minutes, @CUCINAenoteca responded, favorited my tweet, and kept the conversation going. I hadn’t even been to the restaurant, but I already knew I would love it. And love it I did! I should mention that I had been to their sister restaurant in Hillcrest, Cucina Urbana, years ago, and was thrilled when I read that Cucina Enoteca was opening in Del Mar, just a few miles from where my parents’ live. The minute I walked in, everyone was incredibly welcoming and our server, Evan, was friendly and had a great sense of humor. He never once seemed annoyed that we were there for three hours, nor did he push us to quickly select our next course. This was a night out with a friend I’ve known since we were 15, and a rare dinner without any children, so we took advantage and caught up on the last few months. It was so nice to not feel rushed! We wasted no time in ordering drinks–Julie got a red wine flight and I had the tequila mule (jalapeño infused tequila, lime juice, ginger beer). We both loved our selections. 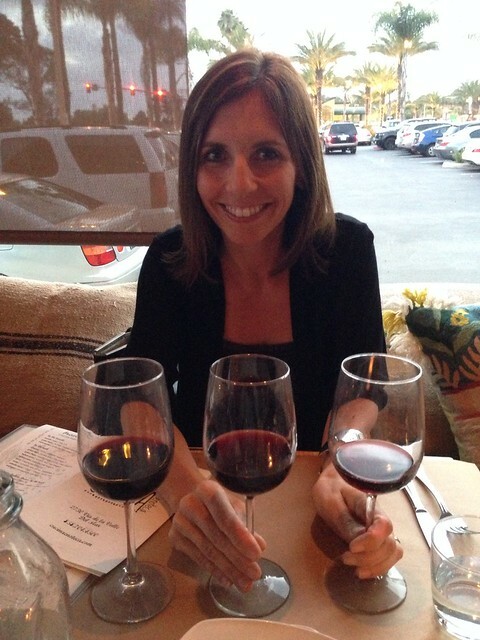 Julie loved her very generous flight pours. 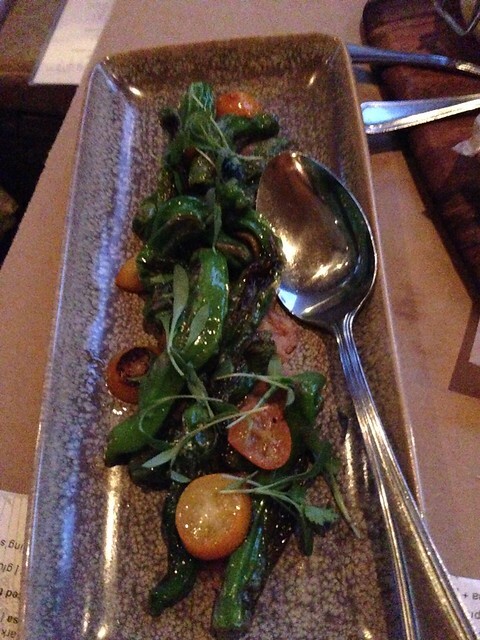 Of course, we had both perused the menu ahead of time and thought we knew what we wanted to start with (stuffed fried squash blossoms), then Evan shared the specials and we opted for the shishito peppers with candied cumquats and walnut butter. 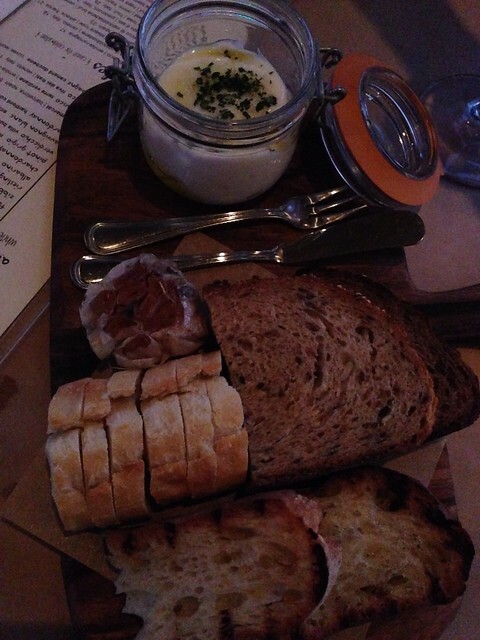 We also selected one of the vasi (mini mason jars with tuscan toast) items and fell in love with the creamy burrata and roasted garlic. I think I went to sleep dreaming of it, it was that good. Not stopping there, we each ordered pizza (which we subsequently took the majority of home–you’re welcome dad). Julie went with the goat cheese and squash blossom pizza (it was beautiful, and I forgot to take a picture of it) which had grilled corn, cherry tomato, lemon preserve, and aged balsamic. 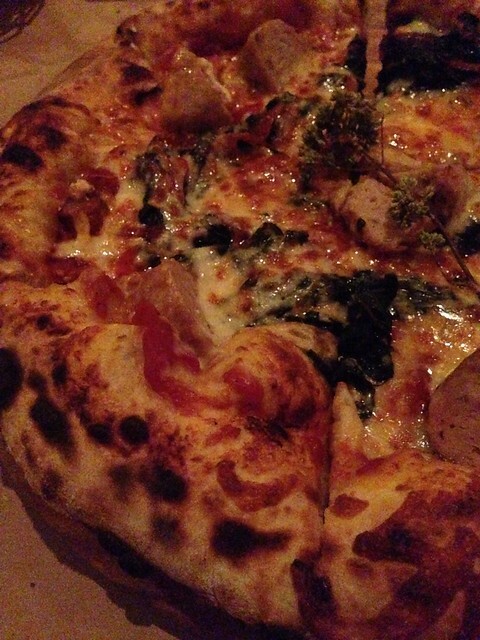 I had the chicken meatball pizza with smoked mozzarella, arrabbiata, and swiss chard. Their crust is light and chewy, and just so amazing. And I was stoked they have chicken meatballs! For about 30 seconds, we actually considered dessert, then decided we were both too full to eat another bite. But the server at the table next to us had just delivered a nutella/donut treat that looked absolutely amazing! Finally, make sure you stop by the ladies’ restroom before you leave. 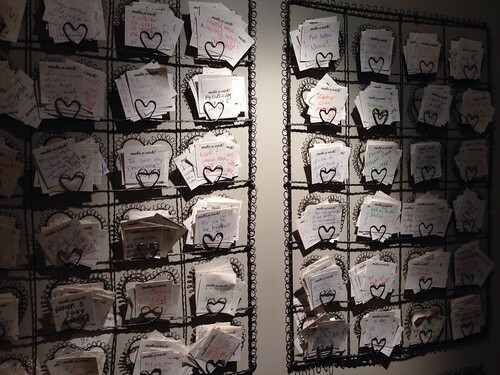 They have paper and pens so you can write a wish and put it on the wall, so cute! If you’re planning a trip to North County, this a restaurant you definitely want to check out. Their food is delicious, very well priced, and the service is stellar! On our way out, Augusto, the manager, asked us how we liked our meal and chatted a bit. Thanks Augusto, I can’t wait to come back! Check out their website for 3-6 pm specials. There’s a wine shop too, so you can choose a bottle to enjoy in the restaurant, or buy one to take home. 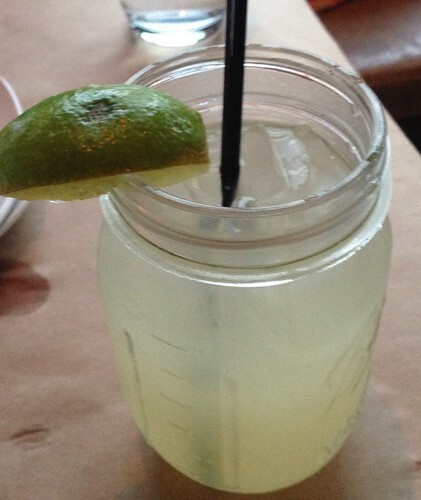 I went there recently and LOVED it…however….a friend of mine ordered a drink based no the waiter’s recommendation. He said it could be a little strong (one of their infused vodkas) but that he would put it “on the rocks” for her and she would love it. Well, she did like it but when the bill came there was a separate charge for “the rocks”! Seriously?! He charged her like fifty cents or a dollar (I can’t remember which) for the ice? She was surprised and so was I. Maybe that is normal some places but I had never run across that before and thought it was a little pretentious…he should have at least mentioned that adding ice (again..really?) would be an extra fee. Other than that the food was great and the environment is amazing. @Chrissy Corrao – That is very strange, I’ve never heard of charging for ice! ?